Edit: now reaching 33.1 billion password hashes per second... see later comment. I wrote software and built a machine capable of cracking 28.6 billion MD5 password hashes/sec, handily beating D3ad0ne's challenge and his 17.2 billion hashes/sec My setup is 1.7x faster, consumes half the power (1200W vs. 2000W+), and costs a quarter of his ($2700 vs. $10k+). This was accomplished with 4 dual-GPU AMD Radeon HD 5970 cards (non-overclocked) on a Linux system, and a new MD5 brute forcing tool, "Whitepixel", that I just released as open source. ighashgpu would NOT have run on my machine because this Windows-only app does not support more than two 5970s due to platform/drivers limitations on this OS. 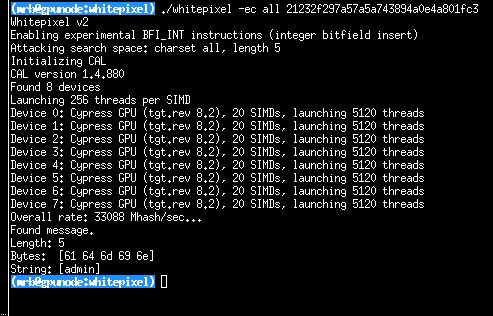 Also, whitepixel is faster than all MD5 brute forcing tools, including ighashgpu. It is my turn to ask... who can beat 28.6 Bhash/sec ? Last edited by mrb on Tue Dec 14, 2010 1:25 pm, edited 1 time in total. Nice man, I love a challenge. To bad I can't run this tool on my system. Also after reading your site you have stats from a 8 GTX580 system. Who has that? I been able to use a x1 slot with an x16 card before. I haven't tried your method though. Are we suggesting, if someone had 8x Radeon 6790 cards we could get roughly 80billion/second on this Linux software? I'm presuming 8x 6790s would be better than 8x GTX 580s ? I'm going to guess you mean Radeon 6970 not Radeon 6790. A Radeon 6970 58.3% the speed of a Radeon 5970 (assuming the stats of 880 MHz and 1536 cores are correct). So 8 Radeon 6970 would give you 33.3 billion/second (assuming they can do the same amount of work per clock-core). Sc00bz wrote: I'm going to guess you mean Radeon 6970 not Radeon 6790. I assume the 6970 is faster than the gtx 580? Oops I forgot to answer that, yes. I released whitepixel v2. The nice surprise is... support for the BFI_INT instruction which allows implementing the MD5 subfunctions F() and G() in 1 clock cycle. My 4x5970 setup now reaches 33.1 billion passwords per second. mrb wrote: I released whitepixel v2. The nice surprise is... support for the BFI_INT instruction which allows implementing the MD5 subfunctions F() and G() in 1 clock cycle. My 4x5970 setup now reaches 33.1 billion passwords per second. 8xHD 6970 should do about 38.6 Bhash/sec under whitepixel v2. Linux drivers support at least 8 GPUs. Windows drivers are limited to 4 it seems. mrb wrote: 8xHD 6970 should do about 38.6 Bhash/sec under whitepixel v2. I hate to sound thick here, but if 4x5970 = 33.1 billion, why doesn't 8x6970 = 70billion(ish)? HD5970 has two GPUs in it. 8 HD6970 is 1.1652 times faster than 4 HD5970. Sc00bz wrote: HD5970 has two GPUs in it. Ah ok thanks for this. I (wrongly) made the assumption that each new ATI GPU would be better than the previous, but obviously not the case with the 5970. So, 8x 5970s could produce about 66 billion hashes/second? Just a few thoughts: The lower GPU clock/voltage, the moar GFLOP/W you get. That's why dual-chip GPU rock so hard: due to lower clock AND voltage each operation costs less energy. My tests shows that on half the clock you spend 5 times less power per operation. I highly favor performance/Watt as opposed to absolute performance, so, yes, I am planning to do many undervolting and underclocking tests... However I am pretty sure that undervolting is more effective than underclocking. My preliminary tests so far show that decreasing the core frequency of one of my 5970s from 725MHz to 550MHz with aticonfig decreases performance by 24% while only decreasing power consumption by 18%: 22.1A@12V down to 18.1A@12V (overall current draw on PCIe slot plus 6-pin and 8-pin connectors), effectively decreasing perf/W. mrb wrote: However I am pretty sure that undervolting is more effective than underclocking. My preliminary tests so far show that decreasing the core frequency of one of my 5970s from 725MHz to 550MHz with aticonfig decreases performance by 24% while only decreasing power consumption by 18%: 22.1A@12V down to 18.1A@12V (overall current draw on PCIe slot plus 6-pin and 8-pin connectors), effectively decreasing perf/W. The CPU code that does over a trillion passwords per second for MySQL323 has divergent code so it will be hard to get nice performance with GPUs or SSE2. Also it only works for a single hash at a time so multiple hashes will slow it down until it gets to a point where it makes more sense to just generate hashes and compare them against a list of hashes you are cracking. Anyway it might get just over 1 quadrillion (my logic: 1 trillion * 2 SIMD/SISD * 28,600/50 GPUs/Core2Solo) but I doubt anyone can get it that optimized. mrb wrote: Mysql323 is kind of low on my priority list because it is rarely requested. So technically speaking the last 2 chars are not brute forced, but from an external viewpoint, it is as if the brute forcer was able to instantly try all possible combinations of the chars, hence the equivalent of "trillions/sec". Sc00bz wrote: Also it only works for a single hash at a time so multiple hashes will slow it down until it gets to a point where it makes more sense to just generate hashes and compare them against a list of hashes you are cracking. If you increase the amount of hashes(which must be > 0 ) twice, you will get a ~3.3x speed drop. Bruteforcing a hash at a time is FASTER than bruteforcing all the hashes, with the exception that you find a lot of hashes at the start, so the process will speed itself up. It is rendered ineffective at 256 hashes. It wont perform on AMD cards as good as on NV cards because of vector datatype.